If you’ve ever walked down Boggy Creek Road, you know why it was so named. After endless miles of trudging and sloshing, even the heartiest of travelers needs a break. So loosen your boots and grab a mug. 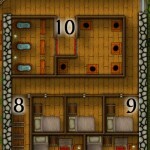 The Slipshod Inn offers a warm hearth, merry company and a comfortable bed for the weary and trail-worn. 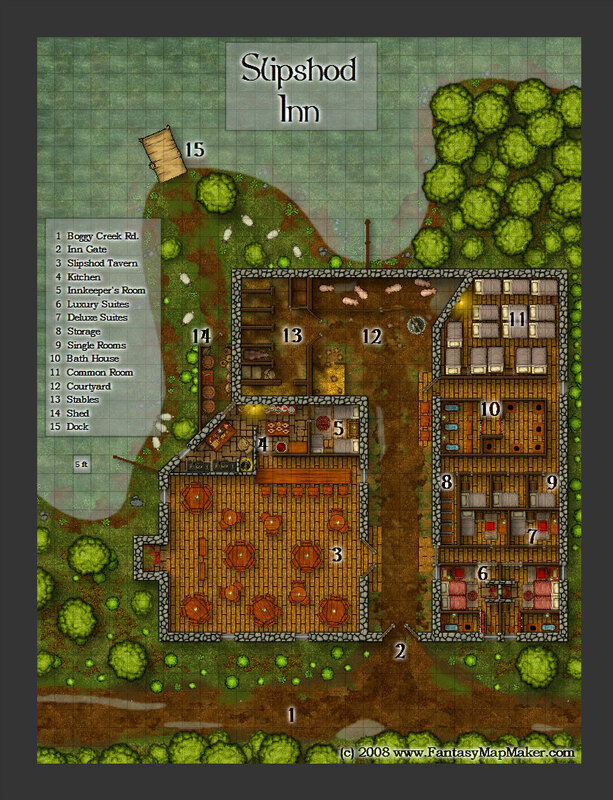 This map was made with Campaign Cartographer and inspired the Tendril Oak Inn, which can be found in their March ’07 Annual on the Profantasy website. Hearty drinking songs reach your ears well before you see the inn. As you near the gate, the aromas of roasted pork, mortrews, blackmanger and cinnamon custard pie tantalize your nostrils. 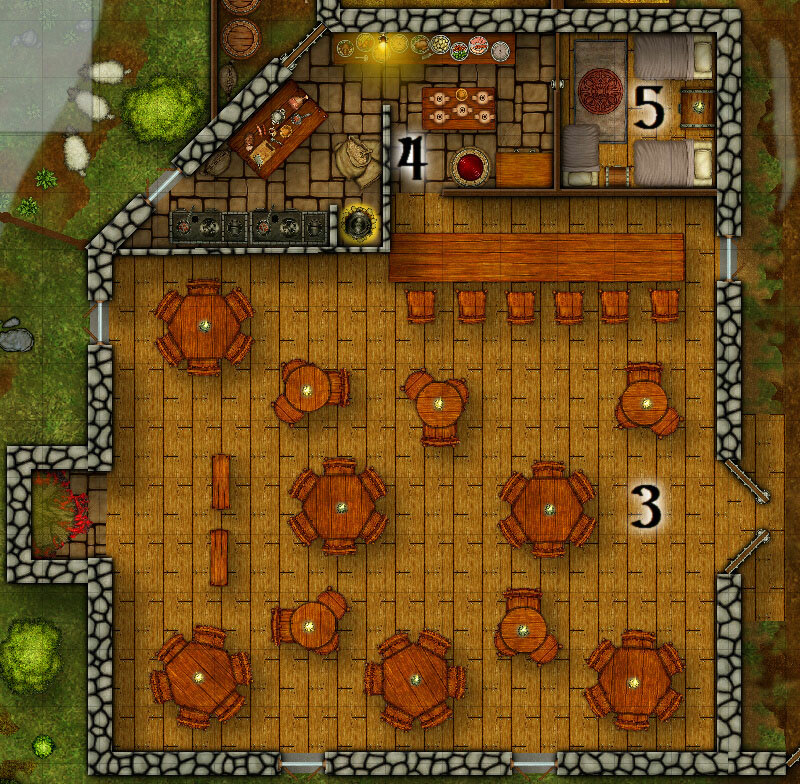 The Slipshod Tavern features plenty of seating and a cozy fire. Traveling bards often perform in front of the hearth, sharing music and tales from faraway places. And if they’re not around, an alcoholic local – Pete the one-eyed midget pirate – will enthusiastically recount some of his sea-faring adventures (which, of course, never really happened – but entertaining nonetheless). Some local ladies tend to do some entertaining of their own, which helps the Innkeeper keep the rooms full. 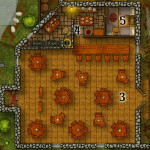 Aldous, the Innkeeper, tends the bar while his wife, Thea, works her magic in the kitchen. Their son Leofrick – a beast of a boy at nearly 6 1/2 feet tall and strong as an ox – serves as waiter, busboy and bouncer. The three of them share a small room behind the bar. Despite his size, Leofrick sleeps on the smallest bed, which his father made for him when he was eight years old. Now 23 years old, his legs dangle off the bottom of the bed, but Aldous promises to get him something bigger as soon as time permits (after hearing this for the past six years, Leofrick isn’t getting his hopes up). Two luxury suites and two deluxe suites can be found at the southernmost side of the inn, and this part of the building has its own private entrance to help keep out the riffraff. The north entrance leads to a few more single bedrooms, a storage closet, a water closet and bathing area and the common room which uses bunk beds to take advantage of the vertical space offered by the high ceiling. Past the tavern and inn is the courtyard, which is normally quiet except for the occasional brawl that spills out of the tavern or common room. 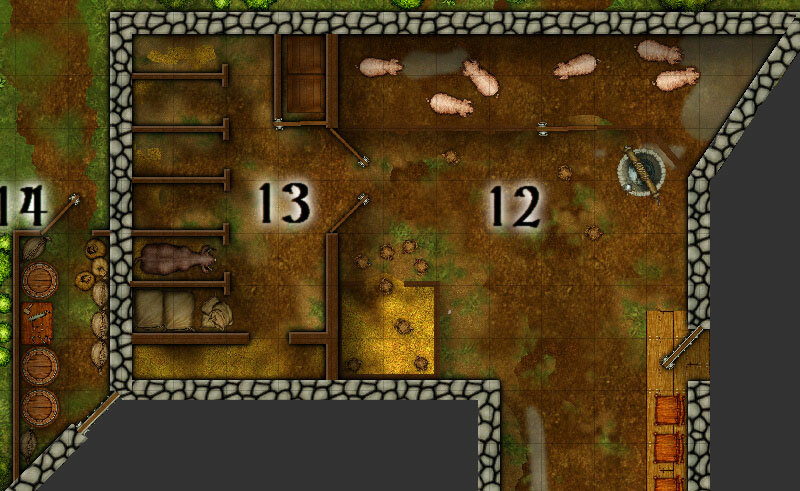 A pigsty and chicken coop give the area a much less appealing aroma than the tavern, and a well provides fresh water. Bryce the stable boy tends to the livestock and manages the stable. He sleeps in the hay on most nights, but is allowed a bed in the common room if there are any vacancies. Behind the kitchen is a storage shed. A path leads from the shed out to the dock where Aldous and Leofrick fish and take shipments from a village on the other side of the lake.